Fairy Quest: Outcasts #1 (Published by BOOM! 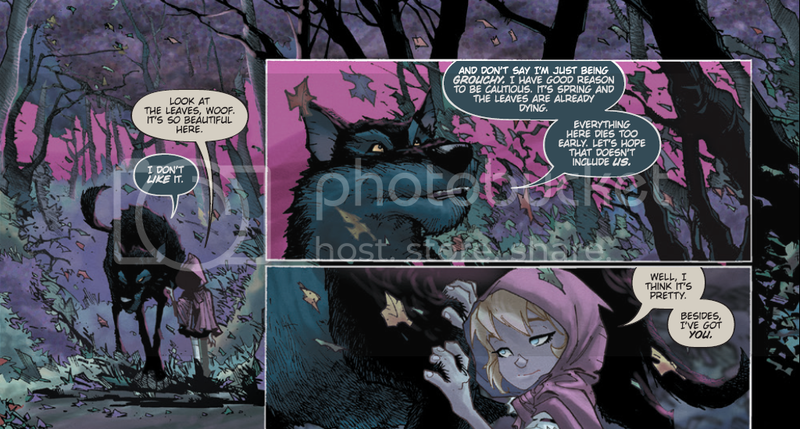 Studios; Review by Draven Katayama; ‘Rama Rating: 7 out of 10):Paul Jenkins introduces his shadowy fairy tale featuring Red, a impulsive Little Red Riding Hood; Woof, her cautious lupine companion; and Fablewood, a land ruled by a callous dictator. I like the humor Jenkins milks from Red and Woof’s opposite personalities: imagine the X-Men’s Hank McCoy baby-sitting Runaway Molly Hayes. Humberto Ramos and Leonardo Olea’s watercolor-like saturated brush strokes make Fablewood’s foliage alive with purple glow. Ramos’ most impressive feat is making one character’s extraordinarily long hair (guess who?) loop and drape panels like streamers. The dialogue is too jam-packed and the plot archetype is familiar – two unlikely companions fight the system a la Divergent or Shrek – but Ramos and Olea make it so pretty, we enjoy seeing this new world unfold.